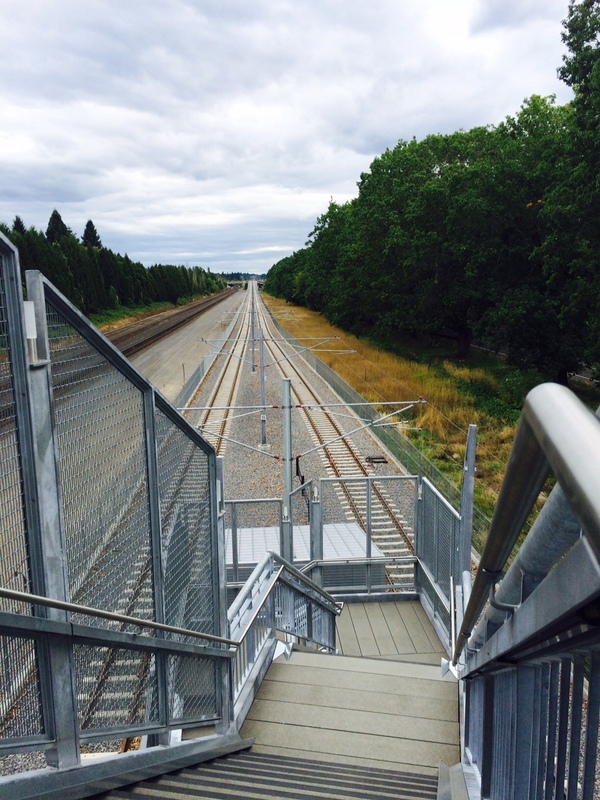 Looking south from the top of the stairs at the Bybee Stop. This is pretty much the same view as looking north with respect to the landscape. BNSF’s tracks lie to the left, the east. The railroads have their own ‘landscape’ maintenance standards set primarily for safety reasons. Within so many feet of their tracks they have a zero tolerance for plant growth and use sterilants. There is also a zone within which the will ‘brush back’ trees and shrubs to keep site lines open. Metro will have its own standard. The two side by side show their combined effect. Also, typically railroads do not fence off their tracks making clear sight lines a more pressing safety concern. Trimet has fenced off the tracks from casual pedestrian ‘conflicts’. Fencelines are problematic for maintenance unless ‘dead zones’ are expanded to include both sides. This entry was posted in Adaptive Management, Horticulture, Maintenance, Plant Choice, Practice, Site Analysis, Street Plantings and Medians, Sustainable Landscapes, Weed Control, Weeds and tagged traffic corridors on October 1, 2015 by gardenriots.